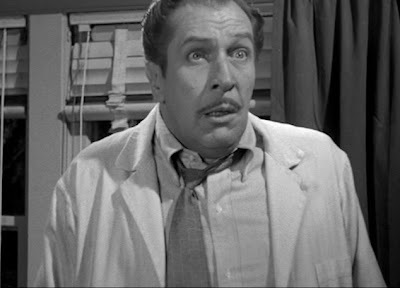 The Horror Digest: The Tingler: Vincent Price Tripping on Acid? Yes Please. 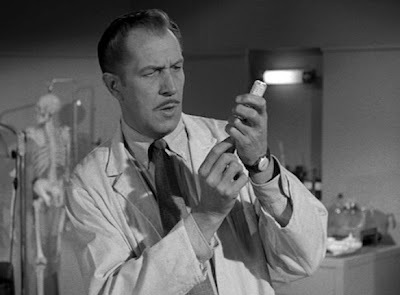 The Tingler: Vincent Price Tripping on Acid? Yes Please. 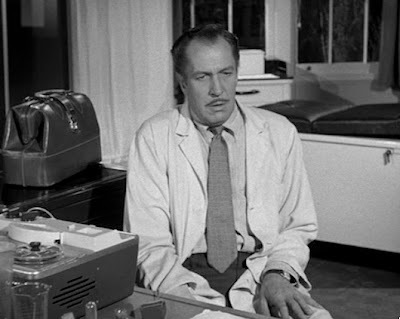 I've never considered myself a huge William Castle or Vincent Price fan. I know, I know I can feel your seething rage from here. The fact is, I had never really seen anything that made me truly want to erect a poster in bedroom--which as we all know is the highest honor I can bestow upon something I love. You should also know that I'm talking about my virtual bedroom that I store inside my head. My real bedroom only has one actual poster and it's of Desmond from LOST, for obvious reasons, mainly being that I believe he is the 2nd coming of Christ. There's also a sticker of the cat from Hausu for the same reasons above. I just knew that my love would be instantaneous. So why did it take me so long? Hard to say. Maybe I didn't want to embrace the William Castle and Vincent Price love so easily. I'm just soo controversial that not loving two people that tend to go hand in hand with the horror genre sounded like the right thing to do. But who am I kidding? 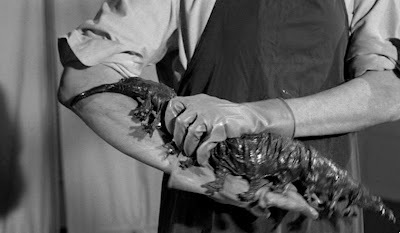 The Tingler was my downfall--because I am now in love. 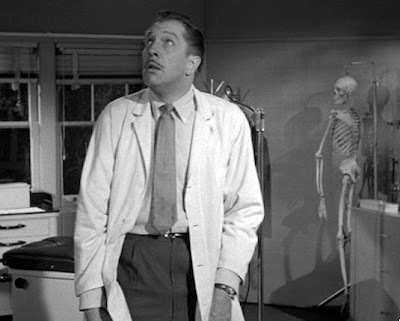 The Tingler deals with pathologist Dr. Warren Chapin who is strangely attracted to studying the idea of what causes that...tingling sensation in our bodies when we feel fear. 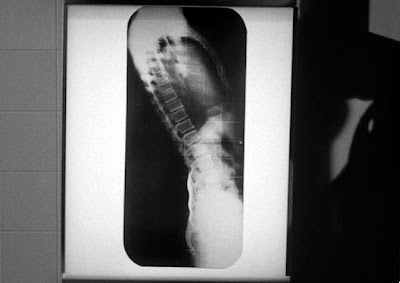 After some handy X-ray work he finds that the cause of the tingling is in fact a parasite that latches onto our spinal cord, growing bigger and bigger the longer we go without screaming. I was surprised myself to find that The Tingler was very Sci-Fi in its details, and this thrilled me. Even more thrilling is finding out that there IS really a parasitic creature in this and it's not just someone pretending to be one--which would admittedly be very hard to pull off. 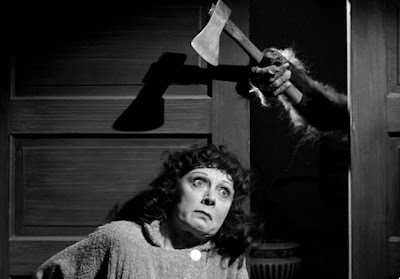 But you see, I think that was one of the turn offs for me about William Castle. I love ghost stories, but when suddenly you find that there were no ghosts, I start calling shenanigans. Whether or not my love is owed to the parasite remains to be seen however, but I do want to make it very clear that the single best thing that happened to me all week was seeing Vincent Price tripping on LSD. Yes, behold the wonder and mystique of one of the greatest scenes of all time! Wasn't that just magical? It was like rubbing it in all those peoples faces that said, "Andre, you'll never be able to see a cinematic icon tripping out on acid EVER" and it felt good. 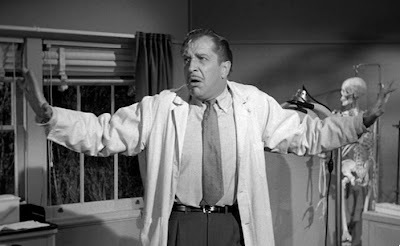 Aside from that wonderfulness, The Tingler just left me feeling deeply jealous that I was never able to attend a real William Castle screening where his gimmicks were in full effect. 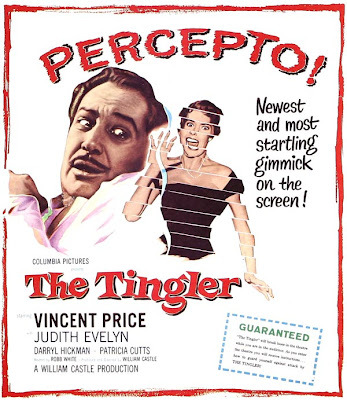 The Tingler is probably one of the more famous gimmick ridden movies as it employed Percepto, which allowed him to attach electric buzzers to the underside of several of the theater seats. 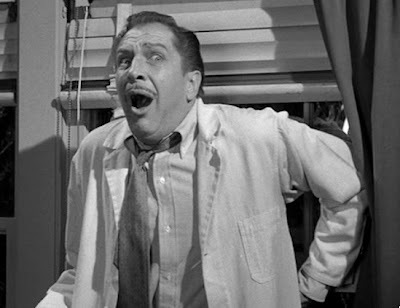 At the critical moment in the film where the tingler escapes into the theater, a blackout ensued consisting of Vincent Price's voice yelling, "The Tingler is loose in THIS theater! Scream! Scream for your lives!". At this moment the buzzers would be activated and screams inserted into the picture's sounds were heard, making it sound like an ultimate portrayal of hysteria. The whole time this was happening I was just SO jealous. It really makes me think about how we should be doing this instead of crappy 3-D. That's really putting your audience into the film, and forcing them to experience it if you ask me. It would be truly delightful. 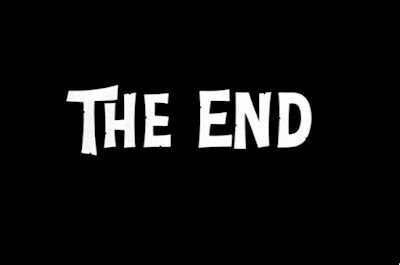 As kooky as William Castle appeared to be, there is no denying that this was awesome. He would even sometimes have nurses stationed as gimmicks and people pretending to faint and then get wheeled off. Man, I really missed out. Aside from the gimmicks, the rest of The Tingler, is still just as effective. I even had to stifle my own scream when Ollie's wife experienced her own "tripping" and found this creature lying in the bed. I'm guessing this is where Jason's pond look came from. This whole scene was actually really spectacularly "spooky" in a fun way. 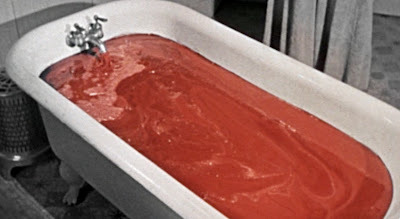 and the bloody bathtub was probably the best thing ever. 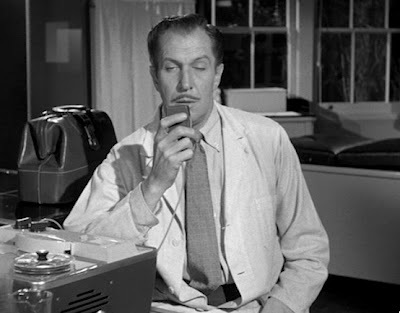 And then right when we are getting all spooktastic, and such--Vincent Price performs an autopsy and finds.....The Tingler! it lives!! Even though the mystique of the tingler is sometimes ruined by the appearance of the wires used to pull it along, I still could greatly appreciate it. 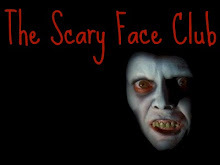 I completely love the idea that this thing is suppose to be inside all of us when we get scared. It's indestructible! It's strong! And if we don't scream, it could kill us! YES. The Tingler to put it simply, exceeded all of my expectations. I knew I would like it, I had a feeling that I would love it but I had no idea that I would be so entranced throughout its entirety. I love you The Tingler. And I don't care who knows! 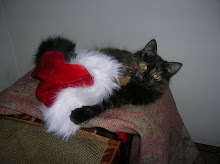 You know...I've been in love a lot lately I admit it. But that's what happens when you realize that you've missed out on so many good movies in your life. 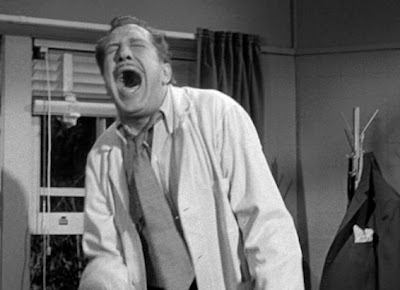 The Tingler with all of its silliness, gimmicks, and wonder will forever now be in my canon of favorite films. Rejoice! 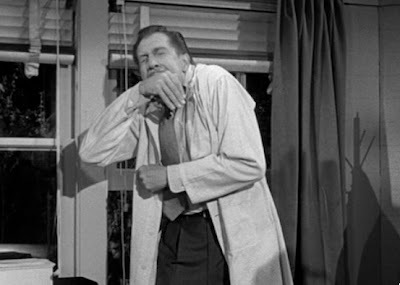 The Tingler is one of those very enjoyable horror-movies-about-horror, and I just love its driving conceit: that there's a parasitic, fear-eating tingler in EVERYONE. It's about as ridiculous/scary as the flying brains in Fiend Without a Face. I remember watching this as a kid and asking my dad, "Do we really all have tinglers?" 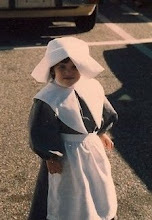 To be fair, though, I was only like 6-7. I'm glad you liked it, and that you can finally embrace the Castle/Price love! 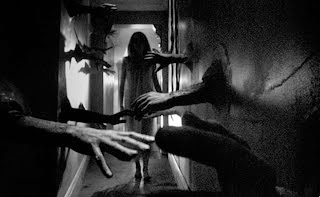 If you need to get another Price fix, I very much recommend Theatre of Blood (1973). It's got camp, eye-gougings, and tons of Shakespeare. Welcome (finally) to the Castle-Price club, Andre! If you're interest is piqued enough to learn more, you should check out the "Spine-Tingler" documentary on Castle. 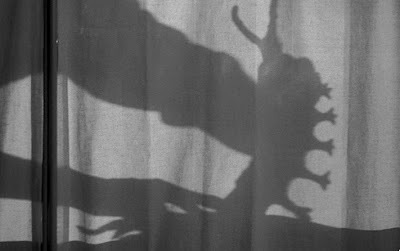 If you're not ready to go full-bore Castle just yet then be sure to avail yourself of Joe Dante's wonderful tribute to Castle (and classic horror/sci-fi in general), "Matinee" (not a biopic but a fictional film with a very Castle-like figure at its center). Thanks for the recommendations you two! I look forward to expanding my Castle/Price love! This was one of the first black and white films I saw. Saw it on Svenghoolie back in the early '00s. I think the idea of the story is so compelling, mixed with Prices's performances, makes this film a great midnight movie. Oh, I love it. I've never been the biggest Castle fan from a cinematic standpoint - lord knows some of these flicks aren't quite right in the head - but his showmanship was freakin' unmatched. And yeah, I too totally want to go back and relive the days of Castle. I was going to recommend Matinee for you in that regard, but I see Paul has rightly beat me too it. 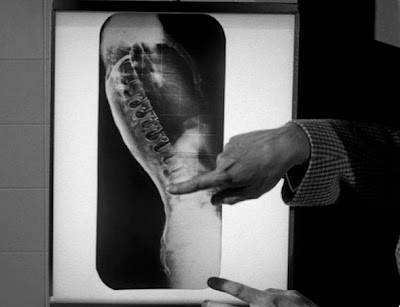 Castle's carnival barker style and schlocky gimmicks aren't for everyone, but "The Tingler" is an example of everything coming together. For a more subdued effort from Price, I might recommend "The Last Man on Earth" if you haven't seen it. For my money, it's the best of all the "I Am Legend" screen adaptations. And yeah...I'll give a third vote for "Matinee". Ah Matinee is on the list now everyone don't worry! Thank you Bleaux Leaux I would LOVE to see a more subdued Vincent Price, maybe that's what prevented me from fully embracing him. Although I do admit to loving his voice. I was jamming to Thriller on the way to work and his voice sent shivers down my spine... was it the tingler? I love The Tingler too! 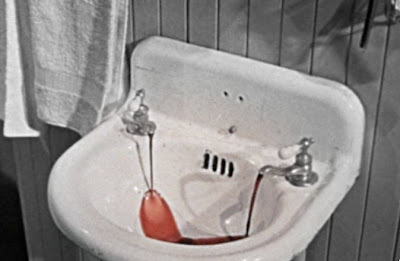 It's so much fun, and also has some spooky sections- I love the scene in the bathroom with the red blood- it's just so cool, and unique to just have that one color inserted into just one scene in the movie. 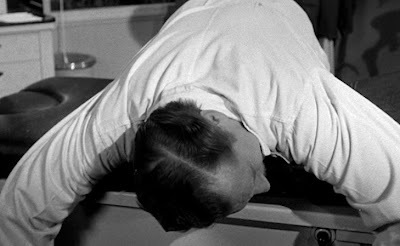 Like you, I wish someone would bring back the William Castle-esque trend. If I was rich, I would totally open a theater where I could create some kind of Castle-esque viewing experiences. Have you seen Popcorn? It involves some college students putting together a film festival celebrating these types of gimmicks...and then a crazy killer starts murdering them. Ack I know I still need to see Popcorn. They just took it off instant watch I was so mad. I know in New York they did a William Castle ish thing and had a few of the gimmicks, like signing the insurance papers and stuff. But maybe you and I should just bring it all back, full force Emily! I agree about "Last Man on Earth." I re-watched it last week and the main flaw is one that could easily be fixed today. The film was shot in Italy with Italian actors and their scenes were dubbed... badly, as if they were in an echo chamber. While I'm totally against colorizing old black & white movies, I'm not necessarily against re-dubbing them. I would love to hear "Last Man on Earth" with the supporting redubbed by better actors who DON'T sound like they're in an echo chamber. But besides that, yes, the irony is that "The Man on Earth" is the most faithful adaptation of "I am Legend" - and yet Richard Matheson had his name removed from the screenwriting credits (simply because the ending was changed) - yet so much more was changed in the Charlton Heston version (called "The Omega Man") and in Will Smith's version. Andre - I can recommend some other Price movies as well - "The Tomb of Ligeia" is very atmospheric with a more subdued Price and "The Abominable Dr. Phibes" requires Price to just act with his eyes while doing a low-key voice-over! One you might like a bit as well is "Witchfinder General" (aka "The Conqueror Worm") - it's considered Price's most horrific role, that of real-life witch-hunter Matthew Hopkins. It's the one that people who don't like Price tend to like (when I finally saw it it wasn't to my taste but I can understand why others were impressed with it). Wow Paul thanks for all those recommendations. 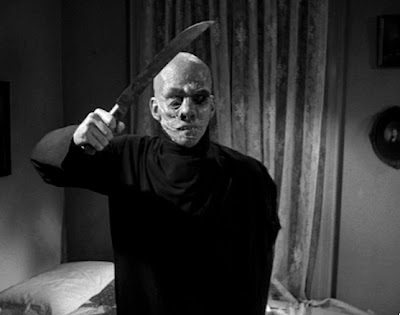 I have added them all--except Abominable Dr. Phibes--I can't believe they don't have that on Netflix...!! 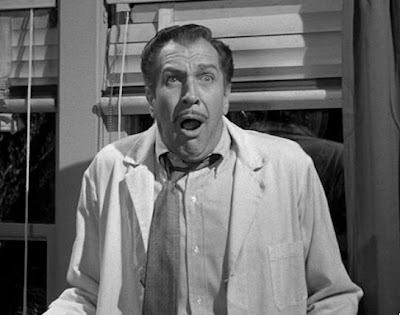 Oh my god - I can't believe that I haven't seen the movie where Vincent Price takes acid! Thank you for that amazing photo essay - this just shot straight to the top of my to-watch list. Ohhh...Andre--you almost lost me there when you announced how you felt about Vincent Price,LOL.But I took a few deep breaths and continued to read the entire post and glad I did,and also glad that you have now embarked on a great journey of discovering more of Price's work.Folks here recommended some great flicks--and I have to second alot of them--but the two Dr.Phibes movies are MUST-SEES IMO,because I saw them at the drive-in as a kid and was terrified!I also want to recommend "The Masque of the Red Death".I'm also a huge fan of Poe and this,IMO,is one of the better movies adapted of his works. 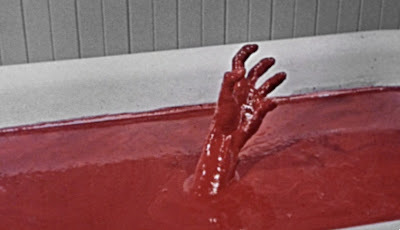 I also agree with the whole 3D thing and how it's taking over.I'd much rather experience "THE TINGLER"!! Ha, sorry amrith to have scared you! I guess most of distate was pointed more towards William Castle. I guess it may speak mroe towards my mood at the time. 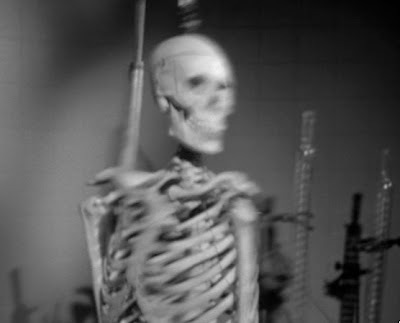 I just really wanted to be creeped out by House on Haunted Hill and I just felt duped. I think I've always had a special interest at least in Vincent Price and now it's definitely more of an appreciation. I have most of the recommendations on Instant watch, but I like to give myself time between similar films...but soon! I will definitely be seeing the Masque of the Red Death very soon.